Thursday our group set off on our Op Shop adventure. With our discount coupons at the ready we were set for some super bargain hunting with some very generous specials for our shoppers. “The Swamp” was our first stop and Ray welcomed us to his huge warehouse full of treasures. Ray is constantly collecting and the group weaved their way through paths stacked with an incredible range of pre-loved gems. 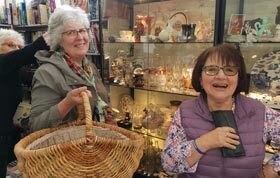 From reals of cotton to garden ornaments the search was on and our shoppers were in awe of all the layers of bric-a-brac on show. Then on to the op shop extravaganza as we worked our way from Bunyip to Berwick picking up amazing bargains. Joan almost floated down the main street of Garfield as she unfurled a sari and Anne’s grandson will be the best dressed toddler in Drouin with the cutest little pieces collected along the way. At our final stop of the day we were welcomed by the lovely volunteers at the Baw Baw food relief op shop in Warragul, where we had our own personal shopper, Glenis, assisting with the new stock on display on the mezzanine level. With years of retail experience on hand we were able to find stylish garments with ease, and have the confidence that they will look just as great when we get home. After a busy day of fossicking it was time to relax and indulge in a well earned cuppa and Laurell, one of the volunteers at Baw Baw food relief, had set an afternoon tea to impress with cakes and home baked biscuits (yes we got the recipe). We laughed as we shared stories from the day and everyone was a winner in the lucky prize draw. What our shoppers are saying…..